Blasters of the Universe knows exactly what it wants to be and it executes on that vision flawlessly. 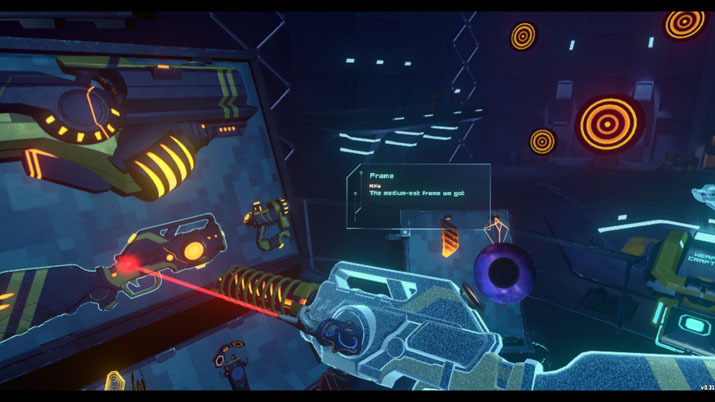 The VR title from developer/publisher The Secret Location is half bullet hell, half wave shooter, oozing style with its 80s/90s nostalgia on its sleeve. Upon starting up Blasters, we're treated to a small cutscene wherein we meet the antagonist who rules over the virtual realm with an iron fist. Alwyn is a tragically funny character who was a loser in the real world; his only solace came from his mastery of the machines of the local arcade. Luckily for Alwyn, he's able to transport himself into a VR arcade machine à la Tron, where he gains control of digital minions. It's your job as a "blaster" to take on Alwyn’s forces and end his virtual reign. What struck me about this cutscene is the style and creativity. The scenes depicting the arcade from the past are like a dynamic comic book. The use of layering and depth looks fantastic in VR, which is something that makes me realize how cool a sort of virtual-reality comic book could be. Even better than the comic aesthetic, however, was the way the title bursts into view, backed by some killer 80s-style synth music. Rarely do VR titles feature much in the way of polish or presentation, so it's hard to overstate the fresh results of developers paying attention to oft-neglected details. The violence is cartoony and bloodless; the graphics, bright and colorful; the story, light and goofy. After a short tutorial that teaches you the basics of weapon customization, you can jump into the first level. In each area, Alwyn taunts you before floating back where he oversees the fight. Alwyn's dialogue can often be chuckle-worthy throughout the battle, such as his referencing of the Sega Master system. A guy who's been inside an arcade machine for decades would have no idea how irrelevant that reference is. That said, I wish more of Alwyn's lines weren't just generic smack talk. Someone being totally out of touch with today's society has a lot of humorous potential, and it's a shame it wasn't capitalized on like it could have been. Another oddity with the writing is the antagonist's overuse of profanity. 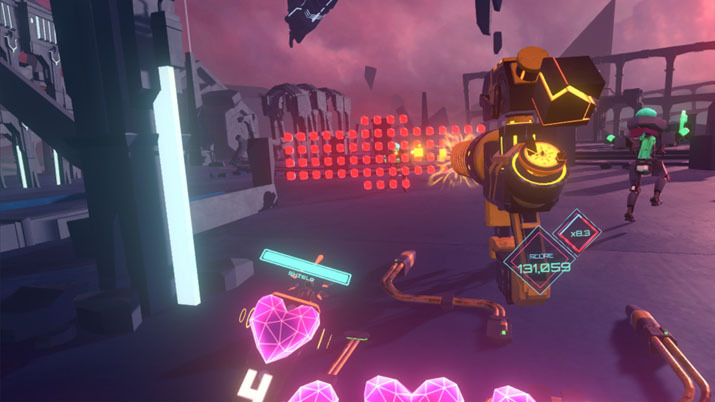 Nothing about the VR shooter indicates that it's only for adults. The violence is cartoony and bloodless; the graphics, bright and colorful; the story, light and goofy. It seems odd, then, that Alwyn would utter enough F-bombs to make Quentin Tarantino would blush (It's a moot point, however, as there is an option to turn off profanity). Blasters of the Universe pulls no punches, as even the first stage is punishingly difficult. This is a bullet hell where your physical head plays the role that's traditionally been filled by spaceships in the genre. Enemies come in waves, and their attacks create patterns of bullets that you have to dodge and weave through or around. At its most intense, Blasters is a heck of a workout — one which had me drenched in sweat after a couple hours of near-constant movement. What's great about the title is that there is a built-in strategy to the gunplay due to the sheer amount of projectiles on screen when enemies aren't taken out fast enough. You may have to choose, for example, whether to take out several easily killable grunts or to prioritize the baddies with massive, hard-to-dodge attacks. You're incentivized to take out enemies as quickly as possible lest you become overwhelmed, which is not an easy task considering the raw onslaught of bullets to which you're subjected at almost all times. While Blasters of the Universe is challenging, it's the right type of challenge. It walks the fine line between frustrating and addicting, thankfully falling much more on the addicting side of things. Not since Stunt Man for the PS2 have I been so compelled to restart levels in the face of constant failure. Look: Blasters of the Universe is really, really fun — and the excellent visual and auditory aesthetics don't hurt, either. In a shooter landscape where swapping out one samey-looking attachment for another might make a one percent difference, it's great to have some customization options that really mix things up. Topping off each stage is a boss battle, and the difficulty carries over, as you'd expect. Bosses have learnable patterns that get progressively harder the lower their health is. In all but one boss, I delivered the final blow with a single health slot left, down from the five you start with each level. Defeating a boss results in an incredibly satisfying slow motion explosion where his various parts whizz by in all directions. It's a nice reward after all the challenging white-knuckle action [EN: Now, where have I seen that before?]. To help overcome the (at times) brutal difficulty is a slew of unlockable gun parts that fundamentally change the shooting mechanics depending on what's chosen. Different barrels, ammo cartridges, ammo types, and modifiers affect everything from bullet speed, to damage, fire rate, and fire type (explosive, single, cluster, etc.). You want a gun that fires slow-moving clusters of explosives which trades speed for damage? You can make it. You want a rapid fire gauss rifle that hits enemies immediately? You can make that too. In a shooter landscape where swapping out one samey-looking attachment for another might make a one percent difference, it's great to have some customization options that really mix things up. In addition to all the individual parts are the weapon frames themselves, each one allowing access to different powers. These special abilities include slow motion, a protective shield, or a devastating laser attack — to name a few. As these can only be used after a rather long charge time, picking the best opportunity is crucial. On your offhand, you can choose between a variety of shields, each with their pros and cons (disclaimer: I used a shield maybe twice the entire playthrough [EN: #humblebrag]). The bullets are so numerous and constant that trying to block anything of significance is a losing game. I'd often be so focused on dodging and shooting that I'd forget that I had a shield at all. I'd have liked to forgo the shield in favor of dual-wielding weapons, but it's possible that feature was sacrificed at the altar of balance. In addition to the main campaign levels, there is an endless mode for each area where you can shoot for a high score, as well as a challenge mode that's unlocked after beating the campaign. The challenge mod cycles different challenges each day that force a certain load out on you and require one to complete a specific task, such as killing 15 enemies while they're airborne. While this mode is certainly interesting, the main draws are likely to be the campaign and the endless stages. Blasters of the Universe is what the 80s thought video games would be like in the future. It's neon-drenched, arcadey, and absolutely addictive; the rare marriage of a great concept and flawless execution. But most importantly: it's a blast.